When I first came to Lyttelton, it was December 2011. I came because I was in New Zealand for two and a half months without much of a plan, and the opportunity had arisen to pet sit here over Christmas. I’d Skyped with the homeowner from Istanbul, right before I made my way to New Zealand via Georgia, Armenia, Sri Lanka and Malaysia. I wasn’t especially excited about Lyttelton – it’s next to Christchurch, which I didn’t think much of – but at least it would be good to have a base for the best part of a month. But I found that I felt at peace here. 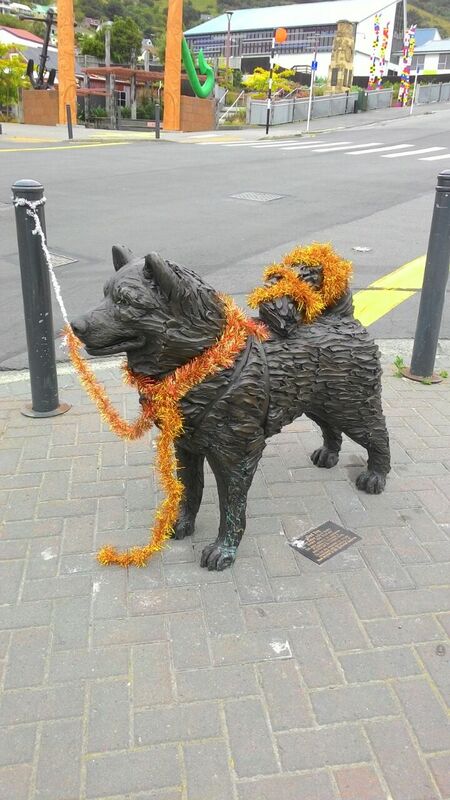 And after that, I came back to Lyttelton to pet sit every Christmas. I also looked after the next-door neighbour’s four cats for the whole of April 2013, and in mid-2014, reeling from the worst break-up I’d ever had, I came back again for lack of any other ideas. I rented my friend’s room for six weeks, cried a lot, and tried to piece myself back together. Okay, so I haven’t updated this blog in quite some time. I’ve been more focused on writing things elsewhere, and reporting on life as it unfolds hasn’t appealed so much. If you’re interested, I’d be happy if you’d check out my website for up-to-date info on my articles, zines and whatnot; and I’m on the Twitter if you’re into that sort of thing. Anyway, I hear the internet is rather fond of cats, so I hope sharing the various cats (also, dogs) I’ve lived with in 2013 might go some way towards making up for my silence here. I began the year, as has become customary, in Lyttelton, a small village (population 4000) next to Christchurch, looking after three cats and two dogs. I live in Kuala Lumpur, currently. My 32-hour stopover in February wasn’t enough, so seven weeks and six countries later, I came back. I’m here temporarily, but for a longer period of time than I spend in most places. I’ve been exploring the city, learning Malay, cooking and eating epic food, following lizards around, and waking up next to someone I’m completely smitten with. And last Saturday afternoon I found myself in front of the Lotus Hotel in the city centre, surrounded by protesters who had just been tear gassed. Behind me, two young women were crying “Allāhu Akbar.” I got out of the way as a trampled body was carried into the hotel. Bottles of water were thrown to the street from the upstairs windows, and eventually a couple of emergency fire hoses were aimed from them as well, to cheers from the crowd down below. Protesters offered salt and water to each other. Riot police paced at the corner of the street, so I figured I wasn’t going anywhere for a while. Masjid Jamek LRT station was closed, but its metal shutters had been broken by people desperate to escape the gas, and police would later follow them in to beat them. I spent two extra days in Kurdistan because I turned up at Sulaimaniyah airport on time for my flight to Stockholm and the airport staff didn’t know anything about it. This turned out to be because Air Sweden had changed the departure airport to Erbil, two hours away, without bothering to let me know. I was now overstaying my visa. I stayed with an activist friend and his family. I didn’t sleep well at night because I was in the room that he normally slept in and he had received death threats. I didn’t bother to mention it because I had only two nights to worry about a prospective case of mistaken identity whereas he had to deal with it every night. They knew where he lived. Finally in Stockholm, I had to quickly come to terms with all the snow and the fact that things were super-expensive. And then on to Berlin for half a day, too tired and in a hurry to bother stating that it felt weird to be back. My home from mid-February to mid-March was Leipzig, where I was looking after a cat while its owner was travelling. I was in a neighbourhood not far east of the city centre. A few times a week I’d head down to the Turkish shops on Eisenbahnstraße to buy flatbread and yoghurt, which I’d eat with my date syrup from Amedi in Kurdistan. I didn’t go out much at all my first week, I was just glad to have some space to myself. I followed the protests in Sulaimaniyah closely, worrying about my friend’s safety. I found myself narrating the cat’s every move. I couldn’t help myself. “Stretchycat!” I’d crow whenever he awoke from slumber and stiffly attempted to straighten himself out. John from Belfast came to visit. We went out to Karl-Liebknecht-Straße, allegedly Leipzig’s most happening street, on a Saturday afternoon. The ghost town effect lacked only tumbleweed. That night we got drunk in a cheap smoky pub called Dolly Dimple. “Maybe it’s a stealth gay bar,” I said hopefully, watching the heavily tattooed girl dancing with female friends to nineties dance music. “I don’t think so,” said John, ever the realist. I requested The Key, The Secret by Urban Cookie Collective and the DJ agreed instantly. I drank a lot of wine. “Maybe he’s a nazi,” I said to John when a shaven-headed boy showed up with a dubious smile. “You think everyone is a nazi,” said John. I attempted to chat up the heavily tattooed girl for him. “Du bist sehr schön,” I explained, harking back to Blur lyrics rather than my two and a half years of German classes. I allegedly turned into a troll on the way home. “You just don’t understand,” I wailed to John, weaving from side to side, “I hate EVERYTHING.” I couldn’t find the way back to the flat even though we were close, and John stopped a helpful passerby for directions. “Yes but what is there to do in Leipzig anyway?” I demanded to know. “Everything,” said the poor stranger after a bewildered pause. I don’t remember any of this. I am sorry for being a troll. After John went back to Belfast I developed a social life. I met New Friend Andre and New Friend Ursula and went for VoKü with them, got a free haircut, took a day trip to Dresden with its tobacco mosque, attended house parties with cheap bars. I realised there were indeed things to do in Leipzig. If I were to move to Leipzig properly in the future, I’d already have good foundations for a life there. I knew that one reason why I thought of my time in Berlin as artificial was that one of its main features had been a relationship that turned out to mean different things to each party. But besides that, it was artificial because it was too easy. If you move to Berlin everyone will be jealous of you. Everyone will tell you that you’ll love it. “Berlin is so you,” they’ll say. It’s not as if you won’t like it when you get there, but the experience will already have been scripted for you to some extent. As an English-speaking expat I’d lived in a bubble where I didn’t need to use German beyond the most basic of transactions, and few of the people I ever hung out with were German and in a way we could have been anywhere. Leipzig was different. Its low immigrant quotient was disappointing in the sense of less multiculturalism – beyond Eisenbahnstraße there didn’t seem to be a whole lot of scope – but at least I was spending time with locals and I felt more conscious of being in Germany. The legacy of the GDR had not entirely faded. “These West Germans,” said one of my friends, “they’ll see apple trees and they’ll still go to the supermarket and pay money for apples. Us East Germans will just pick them.” I learned about the antideutsch people and Kamal K, the Iraqi man who had been murdered in the city centre. I went to the free museum to learn about life before and after the wall. I watched Anita – Tänze des Lasters. It was in German. There were a few parts I didn’t understand but I got the overall gist and even enjoyed the film. I went for vegan kebabs at Vleischerei. There comes a time in every place I go when I’m surprised that it’s almost over. But I have become used to saying goodbye. And anyway I will be back to look after Stretchycat in the summer. Then Vienna, Istanbul, Kandy, and now Kuala Lumpur. I was last here in 1999. I didn’t last 24 hours back then. Cockroach Stuart and I gave up on it and took the first train we could find to anywhere, which turned out to be Penang. Heading for Australia, crossing time zones in short bursts. Every so often, especially as my expenditure currently outweighs my income, I find myself wondering what I am doing. How did it come to this? On my first night I stood on Jeffrey’s tenth-floor balcony. I could see the Petronas Towers and the KL Tower in the centre of the city. I could also see a cluster of lights shaped like a lassoo or a speech bubble, glittering in the sky above a tower block. What kind of futuristic craziness was this? But it was Genting, Malaysia’s Las Vegas, a distant town in the hills, not a projection in the air at all.